(Cleomaceae — the Cleome or stinkweed family. synonym: Polanisia viscosa (L.) DC. Cleome flower Tick weedis probably derived from an ancient Greek name for a mustard-like plant, used by Theophrastus (c. 372–c. 287 BC), whom many regard as the ‘Father of Botany’ because of his books, Enquiry into Plants, and On the Causes of Plants, in which he was, as far as we know, the first person to attempt a systematic classification of plants. I have not been able to track down the actual reference. Viscosa is from the Latin viscosus, sticky. flower & seed pods seed podsThis is an annual herb, branched above, erect, up to 1 m tall, with an unpleasant smell. The stem is angular, rather densely glandular-hairy. The leaves are petiolate, 3 – 5-foliate. The leaflets are obovate, up to 4 cm long, obtuse or rounded, sometime retuse at the apex, cuneate at the base, the petiole up to 14 mm long. 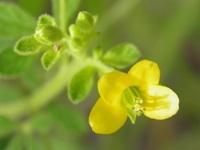 The flowers are relatively few, solitary in axils of upper leaves, and ephemeral; pedicels 5 – 23 mm long; sepals free, narrowly elliptic to oblanceolate-elliptic, acuminate, 5 – 10 mm long, 1 – 4 mm wide, deciduous; petals pale to deep yellow or orange-yellow, obovate to spatulate, rounded at apex, gradually attenuate to base, 6 – 14 mm long, 3 – 5 mm wide; disk obsolete; 10 – 26 stamens, included, the filaments 5 – 8 mm long, some shorter than others and slightly clavate; anthers 2 – 3 mm long; ovary cylindrical, densely glandular-pubescent, sessile. 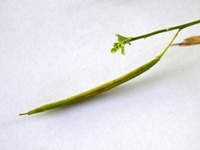 seed pod mature seed podsThe mature fruits are linear-cylindric, attenuate towards apex, sessile, 2 – 4 mm broad, 3 – 10 cm long, erect or strongly ascending, glandular-pubescent, the valves longitudinally striate and dull without, lustrous within. The seeds are about 1.4 mm in diameter, dark brown with fine longitudinal striations and conspicuous transverse ridges. They have no period of dormancy, and germinate readily after shedding. Plants start flowering 3 to 4 weeks after germination, and the life cycle is about 3 months. The plant occurs in northern tropical Africa, from Cape Verde and Senegal to Egypt, Ethiopia to Zanzibar; it is absent in southern Africa, but present in Madagascar and other Indian Ocean islands. Outside Africa it is widespread in peninsular Arabia, tropical Asia, Australia and tropical and sub-tropical America. 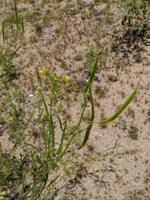 It occurs in woodland and grassland, and is a weed of fallow land, fields, roadsides and wasteland. The plants photographed were near where Picnic Street crosses Butler Creek in Picnic Bay, and behind the frontal dunes in Horseshoe Bay. This is a food plant for the larvae of the Psyche Butterfly Leptosia nina. In tropical Africa and elsewhere, Cleome viscosa is occasionally used as a leaf vegetable. The bitter leaves are locally popular and eaten fresh, dried or cooked. The pickled young fruits are also eaten. In India the seeds, which have a pleasant flavour, are used as a condiment substitute for mustard seed and cumin in the preparation of pickling spices, sausages, vegetables, curries and pulses. It is not grazed by cattle. 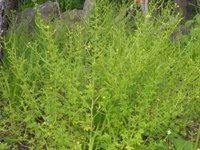 In areas where it occurs abundantly it can be used as a cover plant and as green manure. In Africa and Asia the leaves and seeds are used to treat infections, fever, rheumatism and headache. The whole herb is rubbed on the body against rheumatism. Bruised leaves are considered counter-irritant when applied externally to treat herpes infections. Leaf juice mixed with butter is used to treat inflammation of the middle ear and applied on wounds and ulcers. A decoction is used as an expectorant and to treat colic and dysentery, and the vapour from a steaming decoction of the whole plant is inhaled to treat headache. A decoction of the seeds is used to treat rheumatism, gonorrhoea, diarrhoea and dysentery, and as a wash to treat piles. 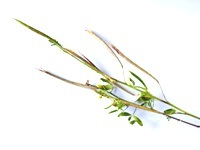 The roots are used to treat scurvy and rheumatism. 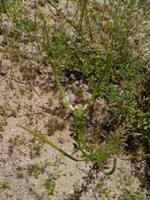 In some regions, e.g., the USA, this plant is considered a noxious weed.